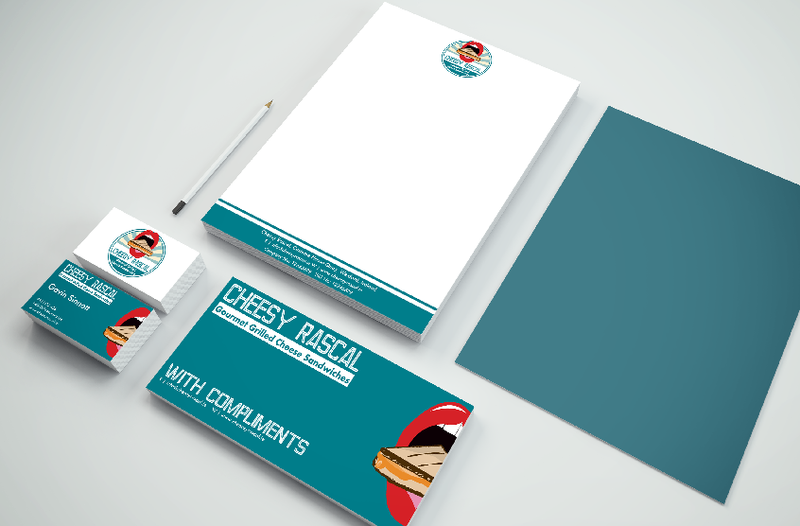 Logo Design | Cheesy Rascal | The Design Girls | Be unique. Be different. We were asked to create a brand new brand for a summertime stall that sells Gourmet Grilled Cheese Sandwiches. We were given words to play off. Funky, On-the-go, Mouthwatering, Trendy, Morish!! The new brand name would be Cheesy Rascal. This was an exciting one... Let's get to work! Concept stage. Creating different illustrations and typeface combinations. Being out in the open amongst other big stalls. We knew our logo had to be striking and memorable. With an image that encourages the customer to try one. Using a simple shape and retro font making the cheesy rascal experience one not to be forgotten. We created a tray cover to accompany each batch as they would be on display on the stall on a tray and easy to wrap if needed to be taken away and stuck together with the logo sticker. We branded t-shirts, coffee-cups, sandwich wrap paper and stickers. We created a logo that was fully responsive for all platforms on screen and for print no matter how big or small it needed it to be. This logo also came with variations of logo and text and text only, for different applications.